To create a symbol, drag your artwork to the Symbol library. 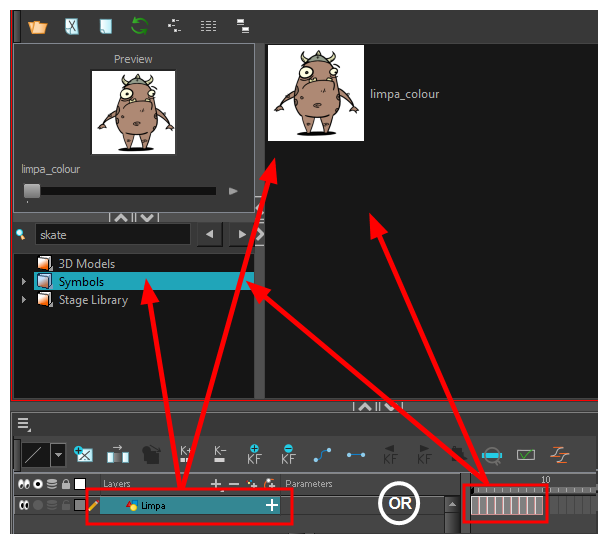 When you drag a symbol from the Symbol library into your scene, it will be linked to the original symbol. If you drag a symbol into your scene several times in the Timeline view, they will all be linked to the original symbol. If you modify one, they will all be modified. In the Timeline view, select the layer or cells from which your want to create a symbol. ‣ From the top menu, select Edit > Create Symbol. ‣ In the Edit toolbar, click the Create Symbol button. ‣ Drag your selection to the Symbol folder in the Library view. In the Enter Symbol's Name field, type the new symbol's name. The new symbol appears in the Library view's Symbol folder. The current selection is not replaced by the new symbol. The new symbol only appears in the library. You must drag it into your scene to use it.